The RiskFive FPGA On Module (FOM) will be hosted by a development motherboard providing the SD card, USB, VGA video, and Ethernet connectors. The FOM will be connected to a motherboard with two high-density Hirose connectors, secured with four mounting screws. 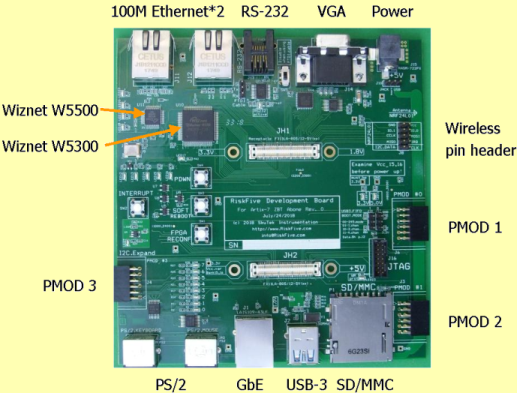 The board shown below is targeting the development of Internet-Of-Things applications. We are providing as many as three different Ethernet chips for the development of lean IOT (W5500) and mid-range IOT (W5300). The gigabit Ethernet will provide high speed streaming. Additionally, the USB-3 chip will support both the streaming as well as in-system monitoring. The application-specific boards can be derived by replacing one or more board's subsystems with other subsystems needed for a particular application. Please inquire if you need a specific set of subsystems or features. Ethernet 1: Wiznet chip W5500 with SPI connection to the FPGA. Ethernet 2: Wiznet chip W5300 with 16 bit parallel connection to the FPGA. Texas Instruments DP83867CSRGZT with SGMII connection to the FPGA. Note: This chip is on the FOM. The RJ45 connector is on the motherboard. FTDI chip FT601Q with 32 bit connection to the FPGA. This chip is nominally capable of 400 megabytes per second burst rate. VGA output generated by the Analog Devices video DAC chip ADV7125. Two PS/2 connectors are provided with 5V signal level. The connectors can be used for keyboard and mouse. One RJ11 jack is provided with RS-232 signal levels. Hardware flow control is used (CTS connected directly to RTS). Momentary power cycle of the FOM. Hardware reset of the Ethernet and USB-3. Software reset of the FOM. User interrupt to the FOM. Switchcraft 2.1 mm power jack for a +5V wall power supply. The board can be powered with the USB-3 connector. The FTDI cable type C232HD-EDHSP-0 can power the FOM directly (up to 450 mA). Purchasing the RiskFive FPGA System. The boards will be available for purchase soon. Please inquire by sending an e-mail from the contact page. © 2017, 2018 by SkuTek.com.